This article is about 2015 pipeline oil spill in Santa Barbara. For the spill that occurred in 1969, see 1969 Santa Barbara oil spill. The Refugio oil spill on May 19, 2015, deposited 142,800 U.S. gallons (3,400 barrels; 541,000 liters) of crude oil onto one of the most biologically diverse coastlines of the West Coast of the United States. The corroded pipeline blamed for the spill has been closed indefinitely, resulting in financial impacts to the county estimated as high as $74 million if it and a related pipeline remain out of service for three years. The cost of the cleanup was estimated by the company to be $96 million with overall expenses including expected legal claims and potential settlements to be around $257 million. 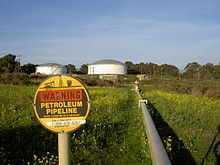 The oil spill, located immediately north of Refugio State Beach in Santa Barbara County, California, originated in a 2 feet (61 cm) diameter underground pipeline named Line 901 owned by Plains All American Pipeline. Crude oil produced by offshore platforms was transported from onshore receiving plants to another pipeline that transported the oil inland for processing. The oil pipeline operators in Midland, Texas had turned off an alarm that would have notified them of the leak as they were dealing with a separate problem with a pump. The 28-year-old pipeline was not equipped with an automatic shut-off valve and was eventually shut down by control operators when they were notified of the leak from parties who visually located the spill. Hundreds of animals along the coast were coated with the thick crude oil and many died. State parks and beaches located along the coastline were temporarily closed. While much smaller than the oil rig blowout that resulted in the 1969 Santa Barbara oil spill, this spill may have greater long term effects due to its potential impact on four state marine protected areas. Due to the unique characteristics of the area, it is one of the most studied marine environments in the United States. The area was one of the earliest locations in California developed for offshore oil and gas production. Crude oil and natural gas produced by offshore platforms is processed at onshore receiving plants before being transported to distant refineries. The source of the spill was Line 901, a 10.6-mile pipeline (17.1 km) owned by Plains All American Pipeline. The 24-inch buried line (610 mm) was constructed in 1987 along the Gaviota coast to service the crude oil produced by offshore drilling. The pipeline can transport 2,000,000 U.S. gallons (48,000 barrels) a day and the contents are heated to as high as 120 °F (49 °C). Santa Barbara area pipelines are typically not heated but they are insulated to retain the oil's heat during transit. The viscous oil is also blended with natural gas liquids to allow it to flow more readily through the pipeline. Truck transportation of oil was phased out in Santa Barbara County in the 1970s because pipelines were considered a safer option. Before the spill, an inspection of the 28-year-old Line 901 pipeline found extensive corrosion problems resulting in thinning pipeline walls. The pipeline did not have an automatic shut-off valve that would have been required on an intrastate pipeline as Line 901 is categorized as an interstate pipeline. Officials from Plains All American Pipeline claimed that installing a new valve would present other potential dangers. The line underwent a comprehensive internal inspection in July 2012 and since then the area where the pipe broke had been repaired at least three times. Line 903 is a much longer pipeline that transports the oil from Line 901 inland to gathering facilities and refineries. LIne 903 was also found to be corroded though not as seriously. Exxon Mobil owns three offshore platforms, Hondo, Harmony and Heritage, that transport their oil to onshore tanks at its Santa Ynez Unit in Las Flores Canyon. They depend on Line 901 to transport the oil from Las Flores to a pump station in a coastal canyon near Gaviota. The crude oil, known as Las Flores Canyon OCS (Outer Continental Shelf), then flows into Line 903 as it is transported inland 128 miles (206 km) to gathering facilities in Kern County and on to refineries throughout Southern California. Venoco’s Platform Holly located in the South Ellwood Offshore Oil Field also depends on Lines 901 and 903. The Holly platform is about 2-mile offshore (3.2 km) from the Coal Oil Point where about 4,000 U.S. gallons (95 barrels) a day comes from natural seeps. Line 903 is also used to move the production from platforms Hidalgo, Harvest and Hermosa of Point Arguello Unit owned by Freeport-McMoRan to the ConocoPhillips refinery in Santa Maria. The narrow coastal terrace where the spill took place is primarily used for recreation and cattle grazing. Local land use agencies have kept oil processing facilities to a minimum along the lightly populated Gaviota coast where much of the land is held in agricultural preserves under the Williamson Act and used for avocado and lemon tree orchards. The parks and agricultural areas on this narrow coastal terrace are situated between a rugged coastline and the Santa Ynez Mountains of the Los Padres National Forest. 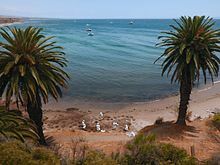 The nearest city is Goleta, about 11-mile down the coast (18 km). US 101 and the main coastal railroad line both parallel the coastline and the Hondo and Harmony oil rigs can be easily seen offshore in the Santa Barbara Channel from the highway or railroad. The Gaviota coast with its Mediterranean climate is considered unique for the biodiversity of ocean life. The unusual species found here are the result of the cold water from the north meeting the warm water from the south. The annual migration of about 19,000 Gray whales through the Santa Barbara Channel was in progress at the time of the spill. They may come as close as 100-foot from the shoreline (30 m). On May 19, 2015, the pipeline operators in Midland, Texas remotely detected pressure anomalies and shut down Line 901 at 11:30 am. The Santa Barbara County Fire Department initially responded around 11:40 am to a report of a strong smell coming from the area. Fire crews found the crude oil flowing from a drainage culvert that passed under U.S. 101, and into the Pacific Ocean and reported the leak to authorities. Local pipeline workers did not know about the leak until they were notified by the state parks staff around noon that there was oil in the water. After struggling to find the leaking pipeline, workers located Line 901 where it had leaked and flowed into the storm culvert around 1:30 pm. Clean-up efforts didn't begin for 16 to 18 hours. Company officials in Bakersfield who were responsible for notifying the National Response Center did not do so until 2:56 pm. The Center, staffed by United States Coast Guard officers and marine science technicians, is the sole federal point of contact for reporting all hazardous substances releases and oil spills. An oil spill triggers mandatory federal notification requirements in a timely manner but company officials said they were unable to contact employees on site as the employees were busy dealing with the immediate demands and distractions of the situation. By the next day, the state parks agency closed Refugio State Beach and El Capitán State Beach. Governor Jerry Brown declared a state of emergency. Santa Barbara County also declared a state of emergency. The Santa Barbara emergency management team eventually recommended that the Board of Supervisors keep the proclamation of local emergency intact till until May 2016. They anticipated that a significant winter storm could bring up submerged oil and the situation could be reassessed in the spring. The oil quickly spread along 7 miles (11 km) of the coastline from Arroyo Hondo Creek to the west to El Capitán State Beach on the east. The slick reached four marine protected areas that have significant for their ecological or cultural significance: Naples, Kashtayit, Campus Point and Goleta Slough. Culturally significant land and artifacts to the Chumash people are also found in this area. An immediate concern of environmentalists was the potential use of chemical dispersants. To keep big slicks from washing ashore, dispersants can be used to break the oil into small droplets that disperse throughout the water column. There are significant concerns about the health effects of the dispersants and the effects on aquatic life. Coast Guard officials overseeing the cleanup indicated that no chemical dispersants were being used but did not immediately rule the use of them out. Plains All American Pipeline stated on May 20, 2015 that at the time of the spill the pipeline was operating at maximum capacity of 84,000 US gallons per hour (2,000 bbl/h). They reported on August 14, 2015 that a total of 142,800 U.S. gallons (3,400 barrels) crude oil had leaked from the pipeline. Preliminary reports estimated that 20,000 U.S. gallons (480 barrels) to 21,000 U.S. gallons (500 barrels) of oil was spilled into the ocean through a highway drainage culvert adjacent to the broken pipeline. The amount of oil leaked was later revised to over 105,000 U.S. gallons (2,500 barrels). A Unified Command (ICS) was established consisting of local, state and federal agencies. This included the United States Coast Guard, the U.S. Environmental Protection Agency, California Department of Fish and Wildlife including the Office of Spill Prevention and Response, and the Santa Barbara Office of Emergency Management together with the responsible party, Plains All American Pipeline. The federal Pipeline and Hazardous Materials Safety Administration ordered the pipeline operator to provide them with the ruptured pipe for metallurgical testing in order to establish the condition of the pipe when it failed. All the oil in the pipeline had to be cleaned out before the section could be removed to determine if corrosion, pressure or a series of failures led to the rupture in the pipeline. Scientists from multiple disciplines at the University of California, Santa Barbara and elsewhere began collaborating immediately after the spill. 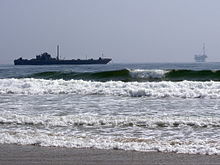 Based on lessons learned from studies of earlier spills, and using refined computer models, they predicted the spill spread and dispersion, including impacts on Los Angeles area beaches. They used this information to provide guidance to cleanup agencies and to monitor the effects on the ecosystem. Some 3,000 feet (910 m) of floating containment boom had been deployed to contain the oil by the next day. Boats and helicopters identified patches of slick in the ocean so cleanup vessels could mop up the oil. More than a dozen vessels corralling and skimming the oil from the water were working in the days immediately following the spill. Three days after the spill more than 650 workers and 17 boats were cleaning the shoreline, gathering up an oily water mixture from the ocean, and hauling away more than 5,000 cubic yards (3,800 m3) of oil-contaminated soil, sand and vegetation from the coastal bluff. A month after the spill, efforts continued to clean the 8-mile-long (13 km) portion of shoreline that was most heavily damaged. The sandstone cliff face along with large boulders that were splashed by the oil coming out of the culvert were difficult to clean. While sandy beaches farther south were inundated with tar balls, the beaches and rocky shoreline south of the spill had been drenched with a slick of fresh crude oil that had not been in the ocean long enough to be altered into tar balls by the wind and waves. Removing tar balls from the sandy shoreline is laborious, detailed work as can be seen on this beach in Florida. Days after the spill, tar balls began washing ashore on beaches down the coast in nearby Summerland and then farther down the coast in Ventura county. Although the source of these tar balls could not be immediately confirmed, the pipeline company sent workers to clean them up. Crews cleaned up coin-sized clumps of oil along the Rincon shoreline such as Faria, the beaches in the City of Ventura including San Buenaventura State Beach, and the extensive oceanfront of the Oxnard Plain. Many officials and scientists said at first the tar balls appearance might be a coincidence unrelated to the spill. Coal Oil Point is very close and well known for the offshore seepage of oil at about 4,000 U.S. gallons (95 barrels) a day. Tar balls continued to show up on beaches farther down the coast in Los Angeles County including Malibu and the South Bay beaches on Santa Monica Bay. When tested, a tar ball recovered in the South Bay at Manhattan Beach matched the chemical signature of the spilled oil. Cleanup crews responded even farther south to beaches in Orange County. By a month after the spill, 93% of the approximately 100 miles (160 km) of beaches damaged after the spill had been cleaned. The remaining 8 miles (13 km) was the area at the spill site near Refugio State Beach and the rest of the Refugio coastline south of the spill. The spill was much smaller than the nearby 1969 Santa Barbara oil spill on January 28, 1969 in which an oil rig blow-out spilled an estimated 3.4 to 4.2 million US gallons (81,000 to 100,000 bbl) of crude oil over a ten-day period. The thick crude oil damaged the coats, skin, beaks, and appendages of hundreds of animals. Workers eventually collected 202 dead birds and 99 dead mammals which included at least 46 sea lions and 12 dolphins. The full impact will never be known since animals may travel a distance before succumbing to their injuries. Sixty-five live birds and sixty-three live mammals were rescued. Of the 69 animals freed after being cleaned and nursed back to health, 10 were adult Brown pelicans that were released at Goleta Beach after spending three weeks in San Pedro with a team of scientists from the Oiled Wildlife Care Network that is administered by the UC Davis School of Veterinary Medicine. In September 2015, SeaWorld San Diego released the last three sea lions affected by the oil spill at Border Field State Park. Scientists will monitor the movements of some of the sea lions and at least five of the pelicans with satellite transmitters. The spill cleanup occurred during the nesting season for snowy plovers so special precautions were necessary while cleaning up tar balls. The birds are often found on the beaches along the coast of the Oxnard plain. Their nests are hard to see in the open sand and the birds are easily frightened away by human activity leaving the eggs to fast-moving predators such as sea gulls. Least terns were another endangered species of bird that was a concern during the cleanup efforts. Marine researchers note that mammals and birds get the most attention but smaller creatures at the base of the ocean food chain are also harmed by the oil. Life on the sea floor and near the shore such as mussels, barnacles, and other shellfish are unable to move out of the way. When exposed to oil, these organisms suffer 90%-plus mortality and recovery of the population can take decades. Plains All American Pipeline estimated that the cleanup had cost $96 million during a joint oversight hearing of the State Assembly Natural Resources Committee and Senate Select Committee on June 26, 2015. Overall expenses related to the spill were estimated to be $257 million in an earnings report for Plains All American Pipeline issued around the same time. This included the emergency response and cleanup efforts along with the expected legal claims and potential settlements. The CEO stated in the report that all but $65 million would be covered by insurance and that the figure did not include lost revenue from the pipelines that have been shutdown. The economic consequences for the county were more difficult to quantify. The financial impact on the county was estimated by the California Economic Forecast Director at $74 million if Line 901 remains dormant for three years because of the dependence of the region’s oil and gas industry to move product through this line. Workers income, property taxes, and federal royalties are reduced while the line is out of service. The impact on tourism was not as bad as predicted and thousands of workers involved in the cleanup appear to have benefited some hotels. The estimate of $74 million financial impact over three years to the county includes approximately $37 million in lost property taxes, $32 million in lessened worker income and $5 million in reduced federal royalties. This is the result of the region’s oil and gas industry being heavily dependent on Lines 901 and 903. Prior to the spill, Exxon, which was the region’s biggest oil operator at the time, was on pace to generate approximately $636 million in revenue in Santa Barbara County during 2015 but as of November 5, 2015 had only generated an estimated $216.6 million. The offshore oil platforms that rely on the lines were forced to shut down when onshore storage tanks were filled. As of December 2015[update], no timetable had been established to restart the rigs. Truck transport of continuing production from the offshore platforms was not allowed by local agencies. Exceptions have been closely scrutinized by local officials such as allowing Venoco in August 2015 to transport crude oil that was already onshore by truck for a limited period. The oil had been evacuated from tanks and pipelines to allow maintenance of the onshore Ellwood facility in Goleta that serves Platform Holly. Almost a year after the spill, the Santa Barbara County Grand Jury handed down 46 criminal indictments against Plains. The Santa Barbara County District Attorney also announced a misdemeanor count against one of the company’s employees. California state Attorney General Kamala Harris, who had also opened a criminal investigation right after spill, said this prosecution will send a message to Plains and to the oil and gas industry in California. The profound economic impacts on local fishermen, who couldn’t fish during the fishery closures, led to the filing of several lawsuits. These suits, along with those by homeowners who are alleging losses in property value, were consolidated into a class-action lawsuit against Plains. An additional class-action suit was filed by stockholders claiming Plains provided “false and misleading statements” regarding pipeline maintenance and monitoring. Plains All American Pipeline was ordered in March 2016 to stop misleading claimants who sought interim damages. A U.S. District Court issued an order that stated that Plains was misleading "victims towards unwittingly waiving their rights to full recovery" through the class-action lawsuit where they could obtain further compensation. The city of Santa Barbara filed a lawsuit in May 2016 seeking $2.1 million in compensation from Plains. The media coverage of the spill had created the perception that the oil spill in the city of Santa Barbara rather than 20 miles (32 km) away in Santa Barbara County according to the city officials. This discouraged visitors during the peak tourism season, losing the city millions of dollars in tax revenue. The federal Pipeline and Hazardous Materials Safety Administration was requested to provide all records regarding the internal inspection of Line 901 conducted in 2012 and details of all other inspections since 2013 such as maintenance data, monitoring information, incident reports and repair logs. 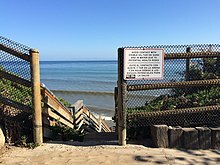 The Environmental Defense Center of Santa Barbara (EDC), who had requested the release of the records along with the Santa Barbara Channelkeepers, filed a lawsuit against the agency in December 2015 since it had been over six months and they had not received any of the requested documents. Three bills were signed into law in response to the spill. Under a new law, the California Fire Marshall will be required to review the oil pipelines conditions every year while federal regulations only mandate a review every five years. Another new law provides for making oil spill response times faster and more effective. Finally, a new law will force intrastate pipelines to use the best-known technology such as automatic shut-off valves. The Pipeline Hazardous Material Safety Administration (PHMSA) is responsible for developing and enforcing regulations for pipeline operation transportation having been created in 2004 within the United States Department of Transportation. In the months following the spill, they found that the in-line inspection tool used by Plains in Line 901 and Line 903 had miscalculated the degree of corrosion. The company also withheld in-line inspection data so “it could enhance its interpretation of the data,” according to a corrective order issued by PHMSA. In October, PHMSA proposed new rules to assist in preventing such inspection discrepancies. On August 15, 2017, Plains submitted an application to the Energy and Minerals Division of Santa Barbara County Planning and Development for the replacement of Lines 901 and 903. The replacement pipeline would restore crude oil pipeline transportation service in Santa Barbara, San Luis Obispo and Kern Counties as it has been determined that the old pipelines can not be used. ^ a b c d Cooper, Lara (May 19, 2015). "Oil Spill Reported on Coast Near Refugio State Beach". Noozhawk. Retrieved May 20, 2015. ^ a b c d e Panzar, Javier; Reyes, Emily Alpert & Mozingo, Joe (May 23, 2015). "Santa Barbara County oil cleanup continues; pipeline may be dug up soon". Los Angeles Times. Retrieved November 29, 2015. ^ a b c d e f g Panzar, Javier (June 24, 2015). "Pipeline firm documents reveal chaos after Santa Barbara County spill". Los Angeles Times. Retrieved November 29, 2015. ^ a b c d e f Kacik, Alex (November 5, 2015). "Refugio oil spill pipeline might take five years to get back online". Pacific Coast Business Times. Retrieved November 29, 2015. ^ a b c d Kacik, Alex (June 27, 2015). "Refugio oil spill cleanup costs near $100 million". Pacific Coast Business Times. Retrieved December 4, 2015. ^ a b c d e f g h i j k l m Kacik, Alex (August 14, 2015). "3 months after oil spill, Santa Barbara region recovering". Pacific Coast Business Times. Retrieved November 29, 2015. ^ a b c Panzar, Javier (June 10, 2015). "Santa Barbara County official rejects plan to move crude oil by truck". Los Angeles Times. Retrieved November 29, 2015. ^ Sullivan, Bartholomew (May 19, 2016). "Turned-off alarm delayed response to Refugio oil spill, federal report says". Ventura County Star. USA Today. Retrieved May 30, 2016. ^ Siegler, Kirk (June 5, 2015). "Los Angeles Oil Blobs Could Be Related To Santa Barbara Spill". NPR News. Retrieved November 29, 2015. ^ a b c d Staff (May 20, 2015). "Fast Facts: Refugio State Beach Oil Spill - Response from Plains All-American Pipelines representatives". KEYT. Retrieved November 29, 2015. ^ a b c d Panzar, Javier & Cart, Julie (June 3, 2015). "Ruptured oil pipeline was corroded, federal regulators say". Los Angeles Times. Retrieved November 29, 2015. ^ Yamamura, Jean (December 14, 2015). "Refugio Rupture Informs Heavy Crude Spill Study". Santa Barbara Independent. Retrieved December 15, 2015. ^ a b Staff/Roadside Attractions (May 6, 2008). "Drivers can/t miss view of oil platforms". Lompoc Record. Retrieved November 29, 2015. ^ "ExxonMobil Production Company – Santa Ynez Unit Project". Santa Barbara County Air Pollution Control District. Retrieved August 17, 2015. ^ Panzar, Javier (June 5, 2015). "With pipeline ruptured, Exxon seeks to move oil with fleet of tankers". Los Angeles Times. Retrieved November 29, 2015. ^ Kacik, Alex (October 16, 2015). "San Luis Obispo County oil operator weighs spin off or sale". Pacific Coast Business Times. Retrieved November 29, 2015. ^ a b "Gaviota Coast Artichoke Thistle Project". Weed Management Area. County of Santa Barbara. Retrieved June 13, 2015. ^ a b Burns, Melinda (May 20, 2015). "'Nightmare' California oil spill damages rare coastal ecosystem". The Guardian. Retrieved May 21, 2015. ^ "Santa Barbara Oil Spill Reopens Fierce Environmental Debate". NPR News. May 23, 2015. Retrieved May 23, 2015. ^ a b c Patel, Neel V. (May 22, 2015). "What the Oil Spill Off Santa Barbara Is Going to Kill". WIRED. Retrieved December 21, 2015. ^ Flores, Oscar (May 20, 2015). "Oil Spill Off Santa Barbara County Coastline". KEYT. Retrieved May 20, 2015. ^ Russel, Angel (May 19, 2017). "Refugio oil spill: What's happening two years later". KSBY. Retrieved May 22, 2017. ^ Kacik, Alex (October 2, 2015). "Feds propose tougher oil pipeline safety rules". Pacific Coast Business Times. Retrieved November 29, 2015. ^ "National Response Center". Retrieved December 7, 2015. This description is based largely on the summary provided by the government agency. ^ a b Frizell, Sam. "California Governor Declares State of Emergency After Santa Barbara Oil Spill". Times Inc. Retrieved May 21, 2015. ^ Salvo, Christina & Stallworth, Leo (May 20, 2015). "Gov. Brown declares state of emergency in Santa Barbara County over oil spill". ABC 7 Los Angeles. Retrieved May 21, 2015. ^ Magnoli, Giana (May 20, 2015). "Governor Declares State of Emergency for Santa Barbara County". Noozhawk. Retrieved May 20, 2015. ^ Lindberg, Kenny (October 16, 2015). "Officials remain concerned about Refugio Beach oil spill". Lompoc Record. Retrieved November 23, 2015. ^ NOAA (May 22, 2015). "Refugio Incident; Santa Barbara, CA" (PDF). Refugio Response Joint Information Center. Retrieved June 4, 2015. 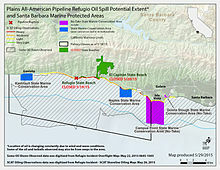 ^ "Refugio Oil Spill, Santa Barbara". Oceana USA. Retrieved February 24, 2016. ^ "California Oil Spill Grows To 9 Miles Along Coast". Huffington Post. The Associated Press. May 20, 2015. Retrieved May 21, 2015. ^ Hayden, Tyler (May 20, 2015). "As Refugio Oil Slick Spreads, Spill Estimate Rises". Santa Barbara Independent. Retrieved May 21, 2015. ^ Estrada, Andrea & Leachman, Shelly (May 22, 2015). "Expert Response". The UC Santa Barabara Current. Retrieved June 8, 2015. ^ ChEnected, AIChE. "How Hungry Microbes Cleaned Up the Gulf Oil Spill". Retrieved June 23, 2015. ^ Hayden, Tyler (June 23, 2015). "UCSB Prof Predicted Where Refugio Oil Would Spread". Santa Barbara Independent. Retrieved June 23, 2015. ^ Press release (July 1, 2015). "NASA Maps Beach Tar from California Oil Pipeline Spill". NASA. Retrieved July 18, 2015. ^ Arvin, Corey (July 2, 2015). "NASA Releases Images of Beaches Tarred from Pipeline Oil Spill in May". NBC Southern California. Retrieved November 29, 2015. ^ a b Panzar, Javier; Cart, Julie & Barboza, Tony (May 22, 2015). "Feds order company involved in California oil spill to test, study pipe". Los Angeles Times. Retrieved December 3, 2015. ^ a b Kisken, Tom (May 31, 2015). "Tar balls trigger concerns about threatened birds". Ventura County Star. Retrieved December 3, 2015. ^ a b c d Mozingo, Joe; Vives, Ruben & Branson-Potts, Hailey (June 4, 2015). "Santa Barbara spill is prime suspect in L.A.-area tar balls". Los Angeles Times. Retrieved December 4, 2015. ^ Panzar, Javier; Serna, Joseph & Hamilton, Matt (July 29, 2015). "Big oil slick off Santa Barbara County coast sparks new concerns". Los Angeles Times. Retrieved November 29, 2015. ^ "Brief Oil and Gas History of Santa Barbara County". Energy Division, Santa Barbara County. Archived from the original on April 18, 2011. Retrieved December 12, 2008. ^ Mai-Duc, Christine (May 20, 2015). "1969 Santa Barbara oil spill changed oil and gas exploration forever". Los Angeles Times. Retrieved December 20, 2015. ^ a b c Panzar, Javier (June 13, 2015). "First rehabilitated pelicans returned into wild after Santa Barbara oil spill". Los Angeles Times. Retrieved November 29, 2015. ^ a b c Brugger, Kelsey (December 24, 2015). "Refugio Reviewed". Santa Barbara Independent. Retrieved December 28, 2015. ^ Gibb, Abbey (September 18, 2015). "Last sea lions affected by Refugio oil spill return to ocean". Fox 5 San Diego. Retrieved December 3, 2015. ^ Staff (August 13, 2015). "Santa Barbara Spill Put Under Microscope". The Maritime Executive. Retrieved November 29, 2015. ^ Rocha, Veronica (June 19, 2015). "El Capitan beach to reopen a month after Santa Barbara County oil spill". Los Angeles Times. Retrieved November 29, 2015. ^ Moore, Jean Cowden (July 17, 2015). "Refugio State Beach to reopen today after oil-spill closure". Ventura County Star. Retrieved December 3, 2015. ^ "Exxon Mobil halts operations at three oil platforms after California spill". The Guardian. Associated Press. June 24, 2015. Retrieved November 29, 2015. ^ Staff (August 19, 2015). "Goleta will allow Venoco to transport oil using trucks". Pacific Coast Business Times. Retrieved November 29, 2015. ^ Kacik, Alex (February 1, 2016). "Santa Barbara County OKs ExxonMobil's emergency permit to truck oil". Pacific Coast Business Times. Retrieved February 2, 2016. ^ Orozco, Lance (May 18, 2016). "Pipeline Company, Employee Indicted On Criminal Charges For 2015 Santa Barbara County Oil Spill". KCLU. Retrieved May 21, 2016. ^ Ward, C. J. (December 14, 2018). "Plains All-American Pipeline pushes for new trial". KEYT. Retrieved December 15, 2018. ^ Farnsworth, Beth (August 17, 2018). "Jury to soon decide Refugio Oil Spill trial". KEYT. Retrieved December 15, 2018. ^ a b Kacik, Alex (December 17, 2015). "Plains accused of misleading oil spill victims into signing away rights". Pacific Coast Business Times. Retrieved December 20, 2015. ^ "Judge Orders Plains To Stop Misleading Oil Spill Claimants". Pacific Coast Business Times. March 3, 2016. Retrieved March 7, 2016. ^ Welsh, Nick (March 4, 2016). "Plains Suffers Legal Setback". Santa Barbara Independent. Retrieved March 7, 2016. ^ "Lieff Cabraser Warns Santa Barbara Fishers, Buyers & Other Businesses Not To Sign Away Their Legal Rights From The May 19, 2015 Oil Spill". Business Wire (press release). March 4, 2016. Retrieved March 7, 2016. ^ Orozco, Lance (May 21, 2016). "City Of Santa Barbara Sues Over Refugio Oil Spill, Cities Taxe Losses Due To Drop In Tourism". KCLU. Retrieved May 21, 2016. ^ Kacik, Alex (December 8, 2015). "Environmentalists sue regulators for not releasing info on tri-county oil pipelines". Pacific Coast Business Times. Retrieved December 18, 2015. ^ California State Assembly. "The Lempert-Keene-Seastrand Oil Spill Prevention and Response Act". Session of the Legislature. Statutes of California. State of California. Ch. 592 p. 90. "Assembly Bill No. 864". October 8, 2015. Retrieved January 27, 2016. ^ "Plains Pipeline, L.P." Energy and Minerals Division of Santa Barbara County Planning and Development. Retrieved March 7, 2018. This page was last edited on 15 December 2018, at 16:16 (UTC).